Why do some project managers achieve their project goals while others fail? Drawing on his years of experience as a recognized global expert on project management and organizational change, author Tres Roeder answers that question, and lays out a proven path to project success. Focusing on the major differences between project management and other types of management—not least of them being the temporary nature of projects versus the repetitive nature of most managerial tasks—Roeder describes best practices in all key areas of managing project stakeholders. 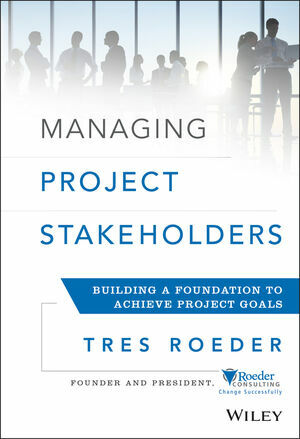 TRES ROEDER is a global expert on project and change management. He has been quoted by the New York Times, the Wall Street Journal, MSN Money, Microsoft Press, Human Resource Executive Online, Crain's Cleveland Business, and others. A former consultant with Booz Allen Hamilton, Mr. Roeder founded Roeder Consulting in 2001. He has led Fortune 500 consulting engagements in areas such as corporate strategy, operations improvement, process improvement and implementation. Mr. Roeder is a PMP® with a BA in economics from the University of Illinois and an MBA from the Kellogg School of Management, Northwestern University.